One of the first steps in starting a business is sorting out logistics and legal matters. Fortunately, there are services out there that take the hassle out of creating legal documents. Today we’ll be looking at LawDepot, who offers a convenient template designed to help you create a customized LLC operating agreement and more. To save you the hassle of weeding through user reviews, we’ll walk through the basics of using their templates, pros and cons of the platform and what you can expect from the service. So without further adieu, let’s jump in! Easy to Use: LawDepot has dozens of simple questionnaires that are a breeze to fill out. The software walks you through the process. Design: Their platform is built with the basics in mind, so it’s a great resource for those just getting the hang of online tools or aren’t yet tech wizards. Secure: LawDepot keeps all your documents safely stored in a single location so you never have to worry. Informative: Not sure where to start? LawDepot provides a substantial amount of information on the basics of building up your business. Comparability: While they do offer a significant legal guarantee, at the end of the day, super-customized, expertly prepared documentation reviewed by an attorney is still the the best option. Risky: LawDepot doesn’t provide access to legal professionals, unlike Rocket Lawyer. It’s highly recommended that you have all documentation looked over by a legal professional, so unless you’re well-versed yourself, or having another look over it, you’re taking a bit of a risk. To put it simply, LawDepot is an online tool that provides legal documents for those of us who aren’t sure where to start. LawDepot lets you create your LLC operating agreement without the hassle of creating an account right off the bat - which I like. They’ll also save your information so you can pick up where you left off, as long as you don’t close the window. Once you’ve created your LLC operating agreement and you want to print/download, it’s THEN time to create an account. Signing up is pretty painless, and after you’ve filled out the majority of the required fields, LawDepot gives you two payment options. 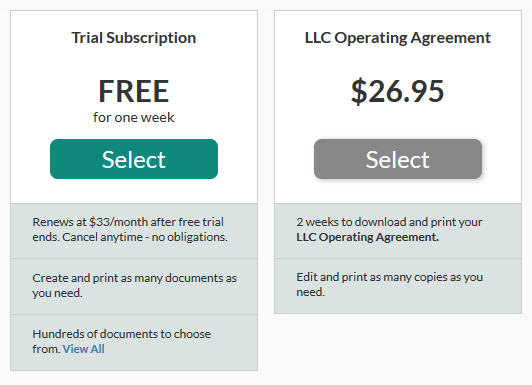 If you’re just looking to create and print an operating agreement then be done with LawDepot, you can choose to pay $26.95 upfront. That being said, this option is only available for two weeks so make sure you’re confident in your document before time runs out. When to Use: I recommend this option if you aren’t quite ready for the commitment for a subscription plan. You can create and edit your operating agreement as much as you like, just be sure to download or print a copy before the two week time limit expires. Trial Subscription = Free for 1st week, $33/mo. For a more all-inclusive package, you can try their whole platform for 7 days. This includes any and all documents you may need in addition to operating agreements. But, if you’re not quite ready for a monthly subscription, keep a close eye on your calendar. After seven days, you’ll be billed $33 for the following month. When to Use: I recommend this option if you are planning to create a number of documents in the near feature. As long as you choose to stick with the service, you can create and edit your documents to reflect the current status of your business. 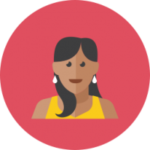 For most entrepreneurs and small businesses who often have ongoing documentation needs, we’d recommend their monthly subscription plan. Their monthly fees are pretty cost effective and allow you to create documents whenever the need arises. Plus, you can always sign up for the free trial, have access to the document, then decide if you like it from there. You’ll have 7 days to try it out and see if it’s a fit. If you don’t think it’s a good monthly investment, just cancel. Moving on to LawDepot customer reviews, most users have had pleasant experiences, with the exception of the votes on BestCompany.com. Occasionally, negative comments will cluster up on one website or another, but other than that - from what I can see, most users would recommend LawDepot. I’ve included all the reviews we could find, including those from BestCompany.com to give you an accurate view of the customer reviews that are out there. As you can see, LawDepot has thousands of reviews for you to sift through. But rather than spend hours reading through each review, we’ve summarized the most frequent comments from users for you to skim through. The most common reason for low ratings that we saw was from users who were under the impression that you could review your first document for free. While you can select the free trial option, and create documents during the first 7 days, you will need to sign up and provide your credit card information to take advantage of that opportunity. Other than that, reviews thought that the process was easy to understand and complete, and we happy with the finished product. Some users even went as far as to run it by their attorney, and we’re happy to report that their legal professionals found no flaws or errors within the final product.